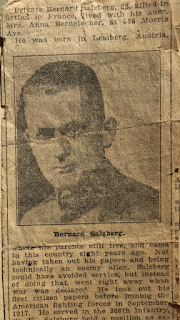 Genomics, Medicine, and Pseudoscience: An immigrant's tale: why we should welcome immigrants to the U.S.
An immigrant's tale: why we should welcome immigrants to the U.S.
1918 obituary for my grandfather. This week I’m taking a break from science and choosing a more personal topic for my last column of the year. Many scientists wouldn’t be here if not for the opportunities offered by a new life in the U.S., and with so much anti-immigration talk in the news recently, I wanted to offer a counterpoint. America is famously a land of immigrants. Some families came earlier than others, but most people in the U.S. today, including me, wouldn’t be here if some recent relative didn’t immigrate. Approximately 80 million people today are either immigrants or first-generation children of immigrants, and many more are 2nd or 3rd generation. Fortunately for me, the obituary was wrong in one critical detail: my grandfather was grievously injured by poison gas, but he didn't die. He survived and eventually came home, married, and had two children, one of whom was my father. Both of my mother's parents were immigrants as well. They fled the pogroms in Poland in 1929 and 1930, barely in time to escape the Nazis. They arrived in the U.S. during the Great Depression, when jobs were scarce, and they never had much, but life in the U.S. was nonetheless far better than in their homeland. My immigrant grandparents could scarcely have imagined that their grandchildren would include doctors, scientists, lawyers, professors, and other productive members of society. As a scientist, immigration affects me in another way. Our graduate education system attracts many of the best students from all over the world, especially in science and engineering. I first discovered this as a graduate student at Yale, when my fellow students came from Europe, Africa, China, and South America–and this in a graduate class with fewer than 20 students. In most U.S. science departments today, the majority of our graduate students are foreign-born, and we are delighted to get them. Many of these students remain here after graduation and become valuable members of society, creating much of the innovation that drives the U.S. economy. They stay because the U.S. offers opportunities that their own countries don’t. The U.S. is a far richer country today–not just economically but culturally, intellectually, and socially–than it would be if we closed our doors to immigrants. I’m not saying we should open our doors to unrestricted immigration: we could be overwhelmed, as Germany and Sweden have been this year. But we should recognize that when immigrants come here to stay–when they want to join the U.S. and become part of our society, with all that entails–they contribute tremendously to the country. We shouldn’t be afraid of immigrants: we should welcome them. Happy New Year, everyone.